At the North End Road Market we recently spotted scallops on the fishmongers stall. They looked so fresh and inviting we decided to treat ourselves to these delicious fruits of the sea. They are an extremely versatile shell fish but can be a little bland therefore it is probably best to combine them with a relatively strong flavour such as mild curry paprika or chorizo and smoked bacon. When we got them home we decided to have a little fun coming up with alternative treatments. Ghaz decided to steam his and came up with a delicious Asian based jus whilst I looked towards the Emerald homeland for my inspiration and pan fried mine with pea puree and boudin noir (black pudding). 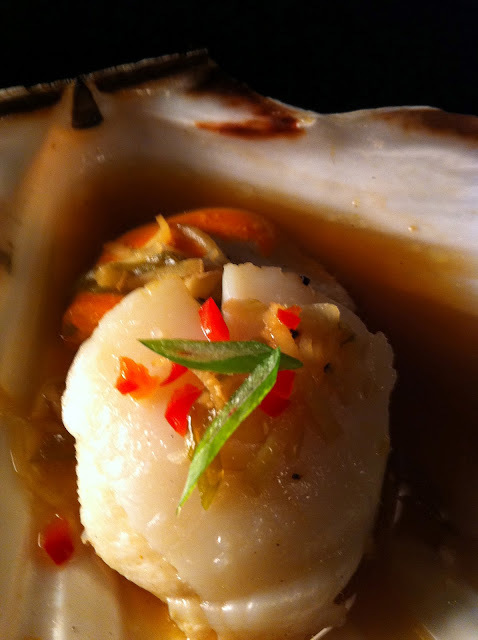 Scallop shells are an iconic shape so we always like to use them for presentation and serving. To open the scallop gently prise open the shell near the "hinge" the shell should open relatively easily, then gently remove the fleshy parts with the back of a dessert spoon. Always use a dish cloth to protect your fingers when opening shellfish. The edible parts are the large white muscle and the orange coral although many people prefer to eat only the muscle. The remaining intestines etc should be washed off and discarded. Shell the scallops as described above, place on some crumpled tin foil or a small dish in a steamer and pour over the jus. Cover and steam for about 8 to 10 minutes or until flesh turns white and firm. Put a few drops of sesame oil into pan and warm. Thinly slice the garlic add to oil and gently sautee. Remove, arrange on the shells and pour over the jus and garlic sesame oil. Garnish with chopped chive and a little sliced chilli and ginger. Pan fried Scallops with Pea Puree and Boudin Noir. Peas cooked with mint, seasoned and pureed. Prepare pea puree in advance by boiling peas and blending with a little fresh mint and butter. Heat a pan and fry slices of black pudding for 3 to 4 minutes on each side. Rub each scallop in olive oil place on the pan and leave for about 2 minutes then turn over and repeat. The flesh should be lightly caramelised. 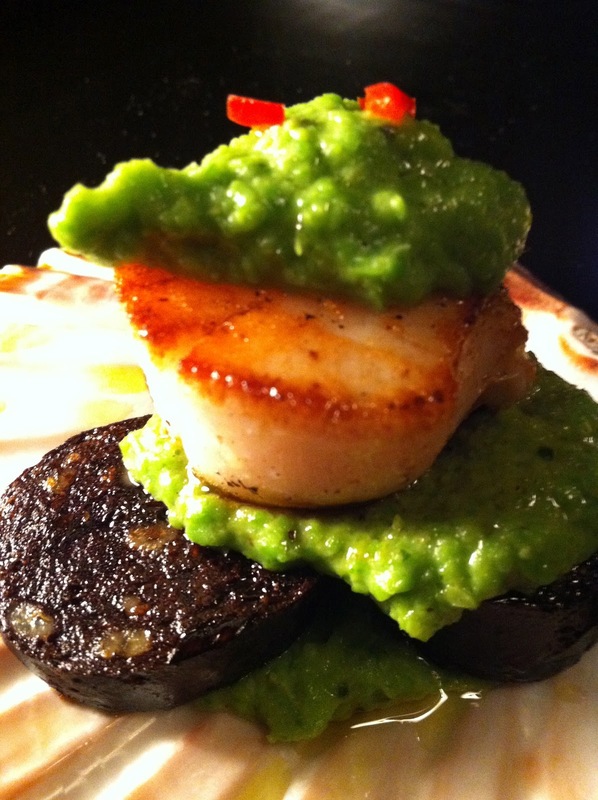 Arrange the black pudding scallops and pea puree as per the photograph. Garnish with a little red chilli and/or fresh mint leaves.